Addmen's OMR (Optical Mark Recognition) software provides complete OMR solution, from designing to printing to reading and evaluating the OMR sheet. This software has two versions: one is standard and the other is the advanced version. Although the features of the standard version are sufficient for designing as well as reading the OMR sheets, organizations or institutes that have to process a huge number of OMR sheets on a regular basis would need some extra help of the advanced OMR software. While IT service providers may not need the OMR software for their official purpose, they may take the contract of reading OMR sheets from educational institutes like schools and colleges, who have to process the OMR sheets once in a year and do not want to buy the OMR software. In such cases, you need a processor that is fast and at the same time efficient too. Hence, the advanced OMR software for professionals fits perfectly for you. Let us try to know about its details. The advanced version of the OMR software possesses all the features of the standard version. However, it has some add-on features which make it a special product. The advanced OMR reader can not only read OMR but also ICR (Intelligent Character Recognition) and OCR (Optical Character Recognition). In other words, this software not only has the ability to read the bubbles and tick marks but also to read handwritten digits (ICR), printed digits (OCR), image as well as barcodes. This is a feature that is exclusively available for those who use the advanced version of the OMR software. You can easily edit the data during the reading process in the manual mode. If the scanned sheets are skewed, you can rectify it easily with auto validation. The software sends alerts when it finds some bubble filling mistakes like over-fill, double mark, etc. This software reads 10000 sheets per hour as it allows multiple instance reading. It allows virtual location or manual placing of improperly scanned or printed index points. You do not have to rescan in such cases. The software uses SQL database at the back end which helps to enhance the efficiency while processing the sheets. You can calibrate OMR sheets that have misaligned rows and columns with this software. You can create several PDF files for OMR sheets with printed variable data. 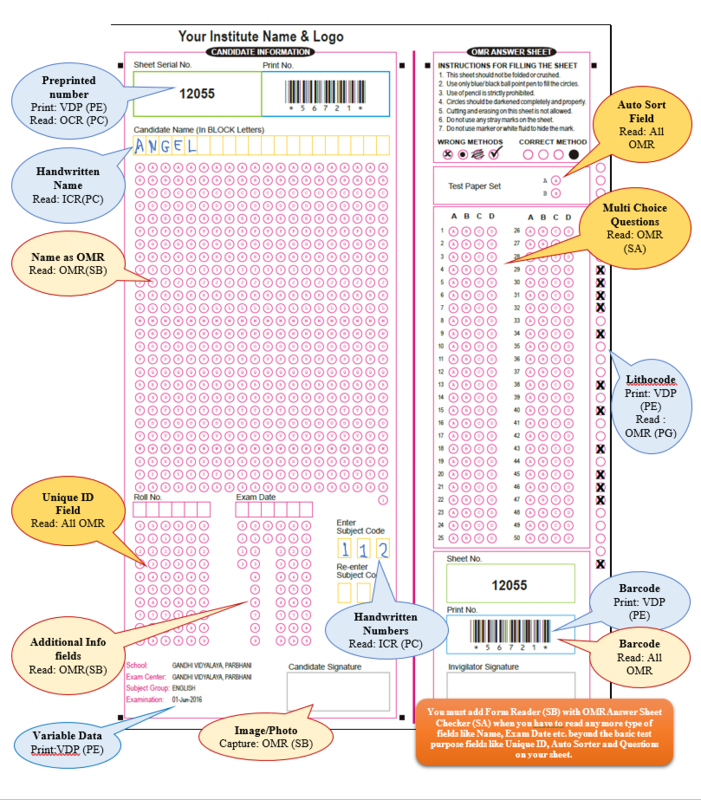 It is possible to print OMR sheets with different designs for printing uniquely numbered multipage questionnaires or forms as well as duplex OMR sheets. You have access to pre-defined OMR sheet templates that can be used to create layouts with the help of Word files. With the advance OMR license server version, you can use multiple terminals without having to pay for each one of them. You can download the terminal OMR utility from the Addmen website. It would be connected to your server with a fixed IP address. Once the sheets are processed by the software, the data derived is uploaded to the client's server. While the server utility has all the features of the OMR software, the terminal utility only possesses read sheet panel and uploading panel. Every terminal possesses a login based access and it uploads the data only in the server where the data has been processed. It is possible to sync the OMR sheets with the terminals even if it is designed at the location of the server. Due to this, the terminals can read different layouts of the OMR sheets. The advanced OMR for professionals is best if you have a requirement to scan huge number of OMR sheets at a really short time.